Whether you’ve coloured your hair before or this is your first venture into colour, choosing a new shade can often be overwhelming. Should you go lighter than your natural colour? Darker? Should you do all over colour? Ombre? Highlights? The choices may seem endless and leave you feeling confused, but that doesn’t have to be the case! Follow these easy tips to pick out the right colour for your skin tone and rock a new look that you are sure to love! Since your hair frames your face, it is important to choose a colour that complements your natural skin tone. In order to determine what your skin tone is, look at your face in a mirror using only natural light. Make sure you aren’t wearing any make-up. Take note of the most prominent tone(s) in your skin. Are they yellow? Pink? Blue? Are they mostly warm tones or cool? Eye colour can also have an impact on your hair colour and vice versa. Try to choose a hair colour that matches the tone of your eye colour. For example, a cool shade for blue eyes or a warm shade for brown eyes. Decide if you’re seeking a dramatic look or a natural look. Choosing a colour that contrasts greatly with your skin tone will create more drama, such as bright red hair against pale white skin. Whereas a colour that is close to your natural skin tone will create a more natural look, like light blonde hair with pale skin. If your hair is turning grey, determine if it is cool-toned or warm-toned. Grey hair with an overall cool tone that is still shiny and vibrant, can be a great look. However, if your grey hair has more of a yellow undertone and looks dull, you may want to colour it with a neutral shade to provide shine and contrast against your skin tone. Don’t be afraid to change your make-up routine! When you change your hair colour, you should adjust your foundation, blush and eye make-up accordingly, such as warm coloured cosmetics for warm reds and browns, and cool coloured cosmetics for cool blondes. If you would like to discuss hair colour options further why not book a free colour consultation with one of hair colour experts. 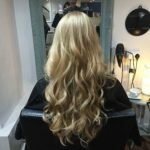 Our Exeter Hair Salon is conveniently located in close proximity to the High Street and Gandy Street, opposite Bill’s restaurant.